Jonathan Saenz is Director of Legislative Affairs and licensed attorney for Liberty Institute and heads the Austin Office, right across from the Texas Capitol. He was licensed by the State of Texas to practice law in November of 2003 and was in private civil litigation practice prior to joining Liberty Institute. He received his Doctor of Jurisprudence from the University of Houston Law Center in 2003. 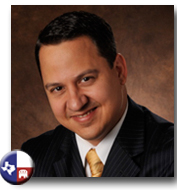 Jonathan Saenz also has a blog, Texas Legislative Update. He has performed continued advocacy work at the Capitol since 2005. Saenz and/or Liberty Institute have been instrumental in helping get laws passed that protect religious free speech of students, parental consent and notification requirements before an abortion, marriage defined as between one man and one woman, and many others. Saenz frequently testifies before Texas legislative and state agency committees on various bills affecting families and freedoms. He has also worked on numerous state and federal court cases, including victorious cases before the Texas Supreme Court and the U.S. Supreme Court. Jonathan Saenz has been featured in local, national and international media such as Agape Press, USA Radio, CBN, America Talks-Live, Dallas Morning News, Houston Chronicle, KCBI-Dallas, KRLD-Dallas, KSBJ-Houston, and the local Fox, WB Channel 33 and NBC Channel 5 affiliates in Dallas and Austin, and FOX’s National Election Headquarters program. Saenz frequently writes editorial articles and has been published in state, and national, and international publications. Jonathan Saenz is also a board member of VOCES Action. Jonathan Saenz was licensed by the State of Texas to practice law in November of 2003 and was in private civil litigation practice prior to joining Liberty Institute. Saenz received his Doctor of Jurisprudence from the University of Houston Law Center in 2003. Jonathan Saenz competed in both national and international moot court competitions, and was also a 2002 & 2003 Public Interest Law Fellow at the University of Houston Law Center. He interned for the Honorable Justice Tim Taft of the First Court of Appeals of Texas in 2001. Jonathan Saenz was president from 2002-2003 of the Pro-Life Cougars at the University of Houston and helped the group win a contentious lawsuit with the university, which resulted in the protection of their free speech rights and a change in university policy. Jonathan Saenz conducts pro-life and grassroots advocacy training seminars throughout the state and is also a former vice-president of the Christian Legal Society at the University of Houston Law Center. Saenz received his Bachelor of Arts in Sociology from the University of Texas at Austin in 1998 and was awarded the Commitment to Service to the Community Award for his volunteer service. You can follow Jonathan Saenz on Twitter.